Quilting. I transformed our formal living room (for goodness sake who uses that anymore) into my sewing room. 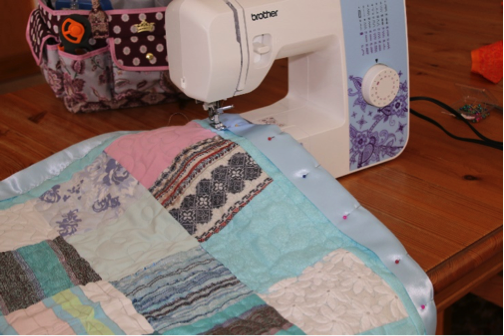 It is the perfect space for a sewing desk and cutting table, an ironing board, a couch and many many completed quilts and a whole lot of whimsy. Wet weather happy flowers. It rained…a lot. But I do not mind the rain, as long as I am watching it from the inside. And yes, it was a bummer not to be able to get out too much (Insert sad face here from Toby). But my flowers absolutely loved it, I have never seen them looking this great at this point in the season. Longwood Gardens and its fountain display…with fire (how do they do that?). Last renovation of the fountains was in the 1930’s so you know this was going to be good. All the amazing fountain displays are synched to a soundtrack. We went to the Beatles night (really good) and the Jazz night (even better). I could do a whole post on Longwood Gardens. It's in the south of Philly with Italian Water Gardens, massive tree houses and just acres and acres of manicured flower beds. Oh, and the beer garden, cannot forget the beer garden. Walking Toby (when it was not raining). Seeing the pure joy on his face as he chases (and misses) squirrels and bunnies although he did catch a couple of ground hogs. I never regret taking him on a walk. Farmers Markets. Got to love that local organic produce. My favorite this summer was the honey guy. All the different flavors of his honey are yummy and I invested in some Royal Jelly Pollen which is a superfood and is tasteless so can go in tea, coffee, on your cereal, in your yogurt whatever you chose. The anti-inflammatory and immune boosting properties of bee pollen are off the charts. Seeing Joe and Chelsea and hiking a beautiful mountain. Climbing to the top of a mountain is physically and metaphorically thrilling. Becoming a 2-dog family... even if it is for just 2 weeks. Going to the movies. We saw Dunkirk, this is very much a British film about 400,00 troops that got stuck on the beach in France and could not get home because they were pinned in on all sides by the enemy. So, a flotilla of small fishing boats from UK harbors came and saved thousands of young soldiers. Very moving and worth a viewing when it comes to On Demand. Face timing with Elliot and Jenny and planning our visit to Seville to see them. Teaching yoga – I have been hugely intimidated about teaching yoga. Teaching kids can be a breeze (if it were not too crazy) and they do not care if you are doing it right or not because they have no idea. But when I teach adults I want to give them a quality product that they paid for. I have been subbing for the gym where I belong and getting over the nerves was not as bad as I thought it would be. Rather, teaching is a joy and I am finding my yoga voice (it’s a thing!). I look forward to teaching much more and developing as a yoga teacher. Trying out some new workouts Pilates and Body Pump – which by the way hurt so you know it’s going to be difficult to walk the next day. But you know what they say, no pain no gain. And so, my summer was full and eventful. So, I have collected quite a few goddaughters in life. A job I take very seriously in terms of keeping in touch with them and (attempting) to be a positive influence in their lives (sometimes easier than others with my wacky personality). It has become a wonderful event to have these girls come visit on their own for a week or two. I have known these girls since they were babies and now to reacquaint myself with them as they are now young adults is a really special adventure for both of us. Emily, Catherine and Sarah have already been on their trips and it was truly a magical and a distinctive event to spend that one on one time with them and get to know them as the amazing young adults they have developed into. The most recent goddaughter week was Ruth. Born a week apart from Elliot and the daughter of a very dear friend, we got to spend many, many hours together even though it was hard for Ruth and her family being in the UK and us being in the USA. Somehow it was not too hard to stay in touch. I loved watching Ruth develop from a small baby (gosh she was so shy) to a child to a preteen and now to a young adult (who is not at all shy!). Watching her grow up was just a joy. To say she is rocking, it is an understatement. M Day – Manicures, Massage, Mall – one of many necessary shopping trips. Retail therapy and all that. Sculpture Garden tour – this turned out to be an epic fail as the heavens opened and it pelted with rain all day. We licked our wounds, ran to the store to get popcorn and then settled in for a movie marathon. Trip to DC - this was the highlight of the trip. Ruth had never been and it’s been years since I was there so we wanted to pack it all in. Here are a few things we did. This is us standing in front of the Whitehouse. 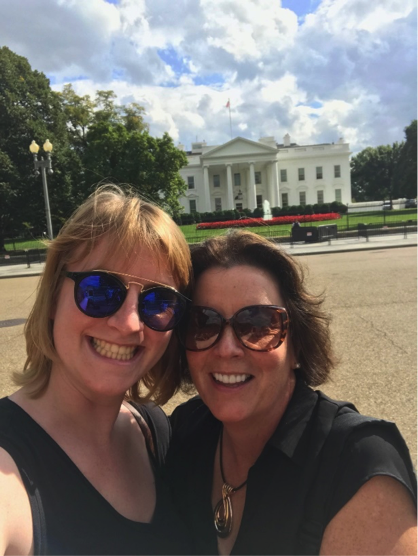 We had hoped to get to as close to the South lawn as we could to get some good pics but the whole area was cordoned off by the secret service (why do they not smile when you ask them a question – so rude). So this is as far as we got. It turns out President Trump was going to his weekend retreat and so he took off in Marine 1 (his helicopter) which we saw so that was a small (very small) compensation. The Newsuem, new one to me, opened in 2007. This is a strong recommendation if you are in the DC area. It was amazing, we were there for 2 hours only because we had other things on our wish list but we could have stayed there considerably longer. So much stuff in there about news history and how news is made and broadcast but our favorites were the legacy of JFK and the gallery of Pulitzer Prize winning photos from journalists, outstanding, emotional provoking and some that just highlighted the injustice of so many. We may have shouted…. on the inside!! 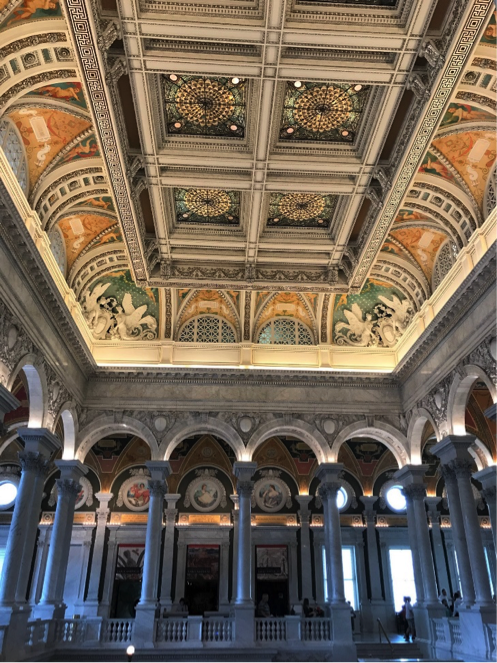 The Library of Congress, must be one of my favorite places to visit. Not only is the rotunda (the place where they keep all the book stuff) outstanding, but the architecture and the mosaics are spectacular. Little known fact, we had lunch in the basement of the Capitol and we found a secret (well not so secret) tunnel to the Library of Congress that not many people find and we felt like we were in a Dan Brown book as we went on our adventure. The Lincoln Memorial, we walked miles to get here but it was totally worth it. The workmanship in the building is intricate and seeing Lincoln in that huge scale was truthfully inspiring. We were weary but extremely saturated by American history (in a good way) when we got home. The next day Hubby took over as I had lots and lots of papers to grade. They went on an impressive 30-mile bike ride and they came back suitably exhausted and sun kissed, much fun was had by all. The last day we went to a National Quilt Show, an event I have been looking forward to for months and it was so lovely that Ruth was here to share it with me. As soon as I got there that went out the window! So many beautiful fabrics and so many gadgets for quilting that I do not know how I lived without. I did come away with some gorgeous fabrics that I am very excited to turning into something beautiful and several knickknacks that I have no idea how I have lived without. And then it was the last day (insert sad emoji face here). We had a good sleep in, to help with Ruth’s overnight flight, and of course did one more trip to the mall for the last-minute needs/necessities/ok I just want it cause it's shiny. I hope this trip was memorable for Ruth because for me it was a joy and a delight every single day. Because of the 3000 miles between us not sure when we will meet face to face again but this is one girl (like all the other goddaughters) where FB messaging will be on overdrive. Thank you, Ruth, so much for coming! Jenny and Elliot are currently living in Seville and because we live vicariously through our children we planned a trip for late September thinking that the temps would be perfect (we were wrong - still insanely hot), and the city would be bright and beautiful (we were right on that one). With over 300 days of sunshine we knew it would be a trip of a lifetime and we were not disappointed. 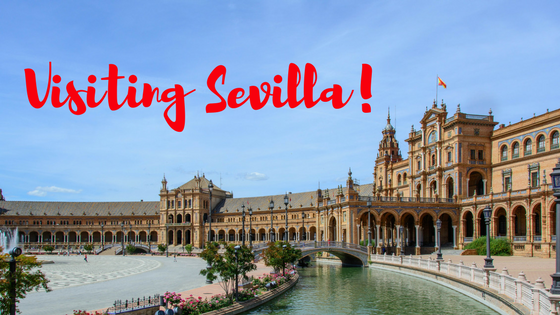 Seville is in the Andalusia part of Spain and is famous for its food, hospitality and flamenco dancing (more of that in Part 2). So many old old buildings. I mean 5th Century onwards with a prominent gothic style which we love. 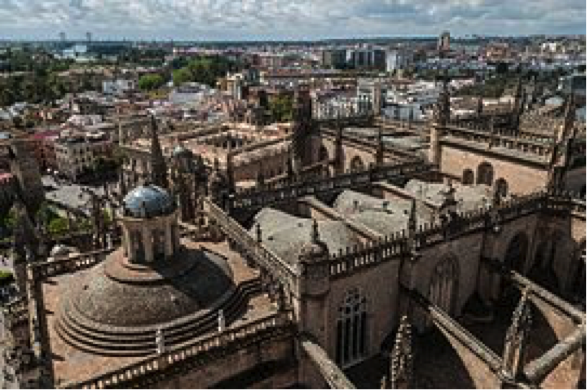 Seville also has a large bull fighting arena (which we did not go to) and a great deal of Moorish buildings, which when the Moors abandoned their mosques, the Christians took them over and made them very Catholic and they were very, very beautiful inside and out. Yes, the place was stunning but the biggest joy was spending time with these two. 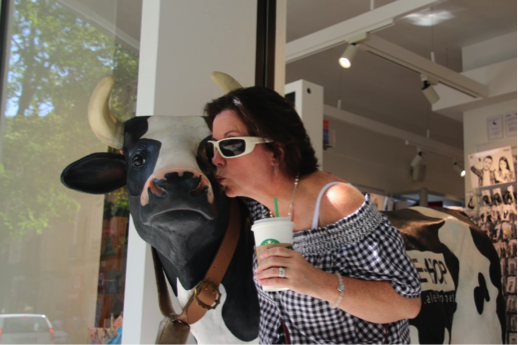 Found a random cow that needed a kiss right after we found a Starbucks where I could get a decent cup of Earl Grey tea (deep joy). Fish markets were everywhere. These were kinda creepy langoustines and all the crab, scallops and shrimp looked amazing but…. sigh…. due to my severe shellfish allergy, I could not touch any of them. And yes, I go everywhere with my EpiPen and my stash of Benadryl. 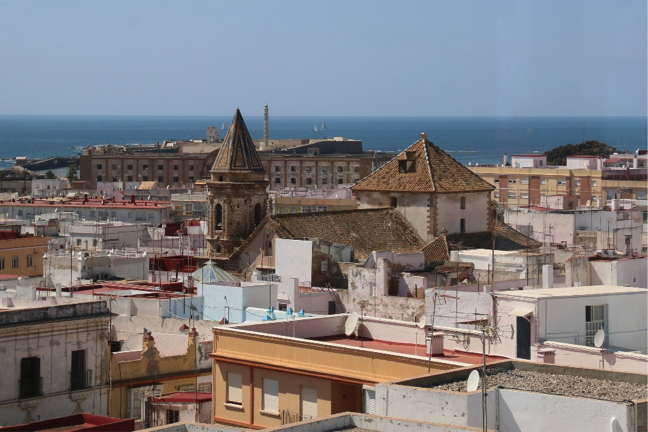 We went to Cadiz which is thought to be the oldest town in Europe. It has over 150 watch towers and we climbed the tallest one to get this view. I guess they wanted to see their enemies coming in every direction. The day we were there, there was weird choir festival going on in front of the cathedral. I would not say they were good but they were very colorful. When we visit our kids it’s such a special time to get to know them better as young adults and these two are as much joined at the hip as they were when Elliot was younger. It is such a special thing to see a child and parent not only respect but like each other. 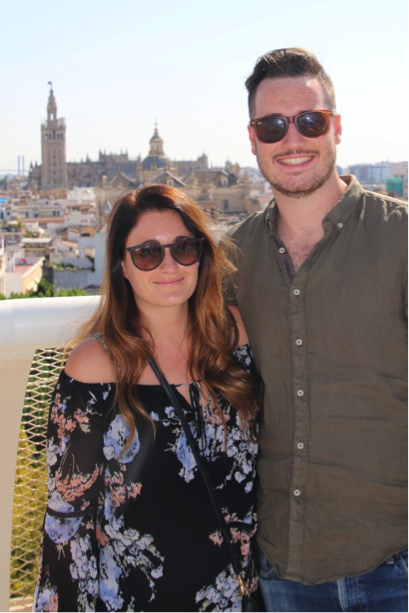 We made it to the beach and explored some of the outstanding architecture in Seville. More to come in Part II. One of the great things about yoga as a beginner is you don’t need much stuff. No expensive sneakers, no weather resistant fancy clothes, no million-dollar yoga mat. If you are a beginner most studios have a supply of yoga mats so you can try it out before you commit. Personally, I am a fan of bare feet, I like that feeling of the air between my toes and it gives a better grip especially for balance poses. Other essentials I enjoy now that I have been doing yoga for a while is a cute yoga bag (has to be cute…right?). Mine has room for my mat and several pockets for all my stuff. Head band – hair in my face when I am doing yoga is soooo annoying and can detract from that blissed out feeling I am aspiring for at every class. Eye pillow – I bought one of these on a whim wondering if I would like it and it quickly became my go to favorite, especially for Savasana. Essential oils especially lemongrass. I sometimes put it on my mat or my eye pillow or a small smidge on my wrists. It smells great, wakes me up for those early morning classes and enhances the yoga class. High waisted yoga pants. These are very helpful with all those up and downs and saves you from that muffin top peeking out (what a vision!). Yoga top that is fitted and has a little bit of compression so it also does not rise up, again with all those ups and downs during class. Mat of preference is Manduka. Speaking of the Manduka mat, I have tried a few and this is the best by a long way. It is a sticky mat which means your feet do not slide, which is very helpful in downward facing dog, warrior 1 and 2 and so many more. When I began yoga, I invested in a couple of cheaper mats…big mistake. They just did not do the job and wore out very quickly. 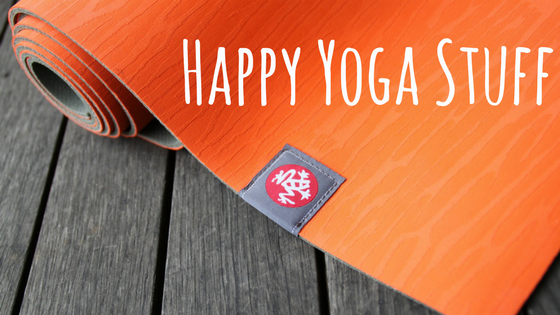 The Manduka mat is an investment but a very worthy one. I have had mine a year and it still shows no sign of wearing out. This website is awesome because they have surveyed over 100 yoginis so you know their information is valid. Easy to navigate with tons of information - I recommend a visit. Hope this blog was helpful and will make your next yoga class even more fun! This blog post was sponsored by http://www.reviews.com/best-yoga-mat/. All opinions are my own and I was not compensated in any way by BestYogaMat. I have been quilting seriously since my early twenties. I remember having a class in school the old traditional way, where you cut out paper piecing, wrapped your fabric around it and hand sewed all the pieces together Even though this was labor intensive I remember it being very soothing and I still like to hand sew the binding which is the final step of the quilt. Fast forward arriving in the States in 1994 to have the absolute glee at finding lots of quilt stores. I discovered beautiful fabrics, still my weakness, if I see something gorgeous I will buy it even if I do not have a project in mind (yet!). 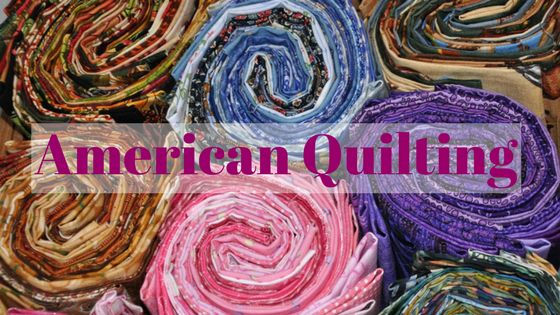 Quilters are known for having a stash, this means a pile of fabrics by the yard …. just in case! These quilt stores also had lots and lots of lovely patterns but best of all they had classes. At this stage, I still considered myself a rookie quilter but enrolling in classes taught me new skills and a whole new outlook on quilting. Then I discovered sewing machines. I know this sounds a little crazy but before 1994 and the grand age of 28 I had never even considered owning a machine. It opened my eyes to chain sewing and piecing without those labor intensive little pieces of paper. 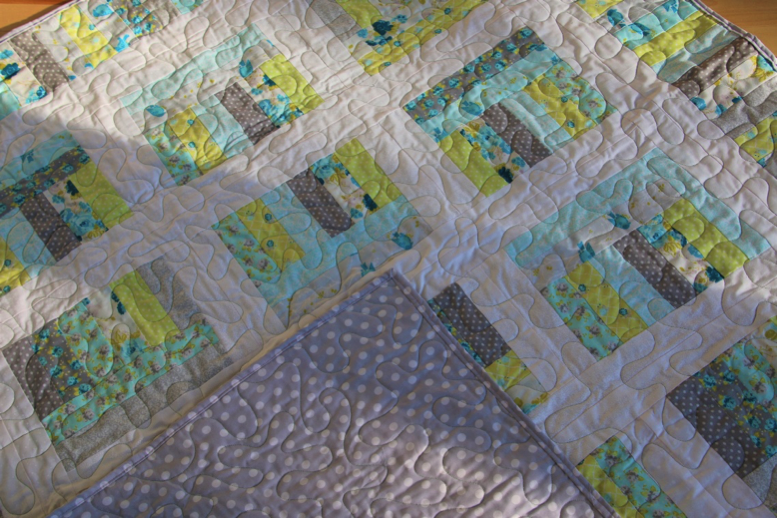 Now I could (with classes and close supervision) make those wonderful quilts in days and weeks rather than in months. This is my 3rd or 4th machine in 25 years because after miles and miles of sewing that sweet hard-working machine gives up the will to live and crosses the rainbow bridge to sewing machine heaven. 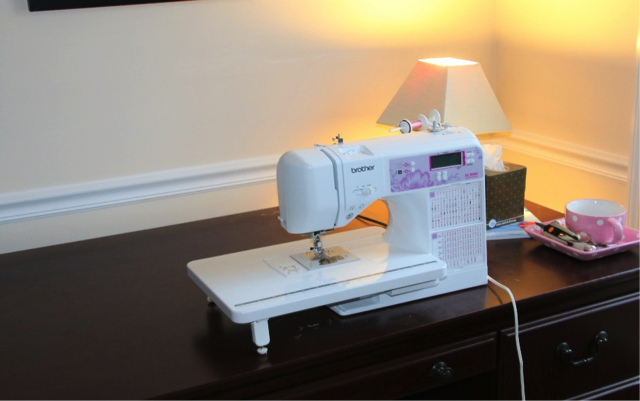 Now you can buy sewing machines just for quilters, I love this one, lots of space to feed through large pieces of fabric, many many different stitch styles. Here are the stages of a quilt that I am working on right now. You start off with fabric. This is called a jelly roll (don’t ask me why!). 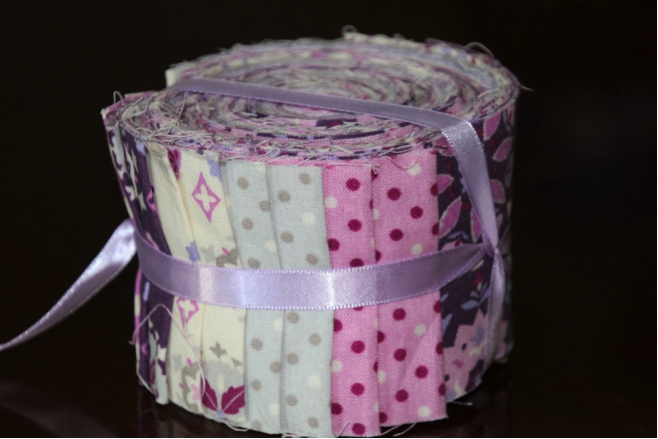 I love these because you get precut 2 ½ inch coordinated strips, because cutting and matching fabric can be the most fun but also the most challenging. Roll out your jelly roll and separate the darks from the light. 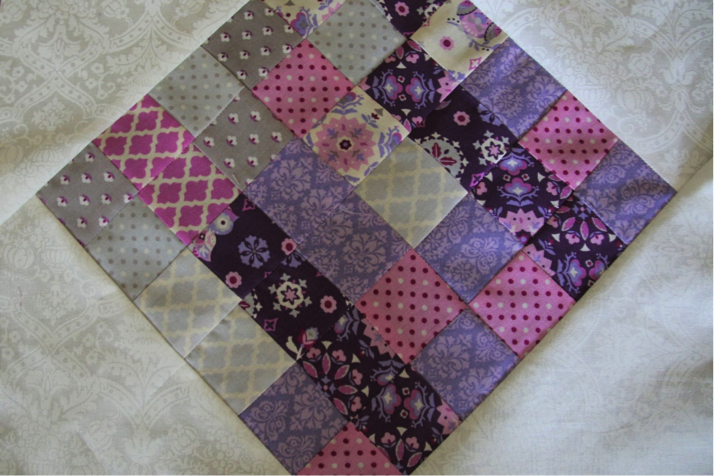 Cut the strips into 2 ½ inch squares, organize a pattern and sew together. 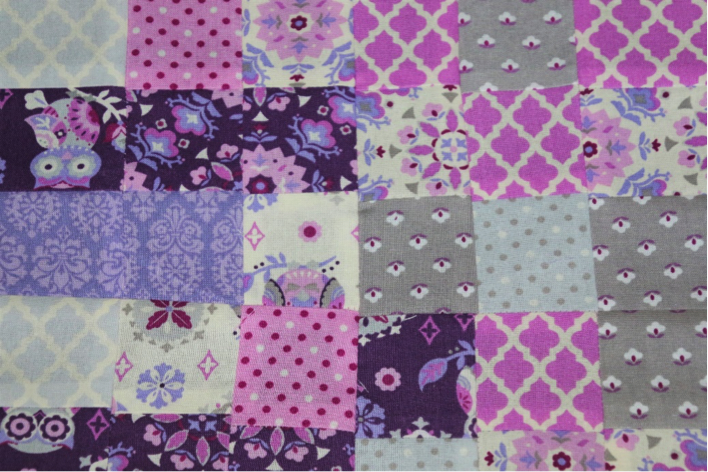 I prefer to just go haphazard with no particular order, that way you get a really scrappy quilt which is kinda fun. Sew triangle on each corner then you can rotate the block into various ways to optimize the overall affect. Put on some borders and you are nearly done. Every part of the process is very soothing to me. I usually have a person in mind when I start a quilt. I think of them all the way through and stitch love hope and courage into the quilt or whatever they may need at that time in their life. Here is one of my favorites, a throwback to where I came from! Here is one I just finished, I already have someone in mind for this one. It’s about finding your joy in whatever way that may be. For some, it's baking or reading or walking or climbing mountains or gardening. 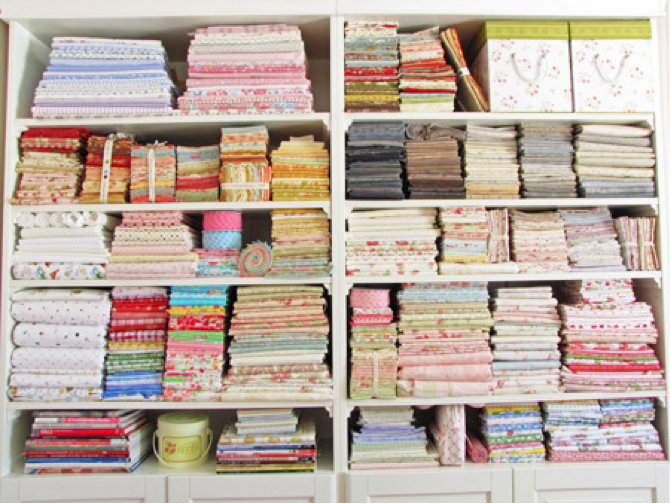 And for me, it’s all of these but nothing feeds my soul like making a quilt. I am a collector of quotes, I find them inspiring and nurturing. I have a file of them on my laptop which I go to every now and again for inspiration and comfort. I am especially a fan of Winnie The Pooh quotes. They transcend time, are classic and are still relevant today. As an aside, when we lived in Oxfordshire, England we were near A.A.Milne's home. We would go to Whittenham Clumps when Joe was small and teach him to play pooh sticks. It was a special time. Here a few of my favorites Winnie the Pooh quotes. Sometimes the smallest things take up the largest part in your heart. As soon as I saw you I knew a great adventure was about to happen. Will we be friends for ever said Piglet, longer said Pooh. How do you spell love? You don’t spell it you feel it. When all else fails- take a nap. Yes Piglet? Nothing said Piglet I just wanted to be sure of you. Could be worse, not sure how, but it could be. The nicest thing about rain is that it stops eventually. You are braver than you believe and stronger than you seem and smarter than you think. Ok now onto other stuff. As a flawed individual I have many faults, they could be interpreted as vices or guilty pleasures. I try and keep most of them under control, but heck it’s not that healthy to live a life pure as the driven snow. Balance is an important aspect of life so I don’t beat myself up too much. As a self-proclaimed vegan/vegetarian, I have a weakness for sausage. Don’t judge me. As a self-proclaimed vegan/vegetarian, I have a weakness for cheese. I like to watch reruns of The Kardashians, I find it very entertaining. I have an Amazon habit, it’s just too easy to push that buy button when your cart has something in it. Books, I rarely deny myself from buying a book. Every now and then I donate boxes of them. Why? So, I have room for more books! When making cupcakes I always leave some batter in the bowl to sample. I am addicted to Netflix, my favorite genre is crime series, animated movies and documentaries on nutrition. It’s important to have diverse choices! I am OCD about cleaning and tidying up. This irritates my family to no end when I put that item that they need right now in some drawer or closet I cannot remember - oops. I love NFL football. During the football season, it is not unusual on a Sunday afternoon to find me watching four games back to back while I grade papers and make a big Sunday dinner. Favorite team, the Green Bay Packers, a throwback to when we lived in Wisconsin. I am sure there are more, but really, that is enough to consider right now. Life is up and down with quotes and guilty pleasures but it is never boring. 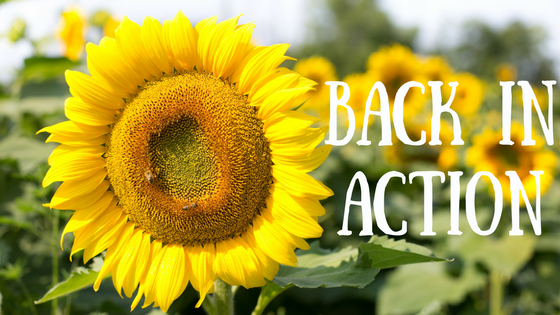 Been MIA for a while from the blogging world - a combination of some serious writer’s block, finishing a semester with a lot of very intense children’s yoga lessons (can you imagine 20 kids doing the Very Hungry Caterpillar yoga! ), and the beginning of summer where my mind and my body was begging me to breathe, be still and so, I did. But I’m back. Life has been full and fulfilling in the meantime. We went to New Hampshire to spend time with the lovely Joe and Chelsea and climb some mountains. On this day the sky was so clear we could see Canada in one direction and Maine in the other. We said goodbye to Elliot and Jenny, who had been home for 10 weeks (oh how I loved having them here). They have embarked on their next adventure to Seville, Spain via Portugal. They are having a ball. We Facetime a lot. We took lots of beautiful walks around the reservoir and because the spring and summer have been so wet (oh when will it ever stop raining?) everything is very lush and green. We took some day trips. This one is to Longwood Gardens - my happy place, acres and acres of gardens full of flowers and fountains. I was recently asked to write a blog post for the dog site: Mattie & Margot (www.mattieandmargot.com). I have written about Toby before, my trusty Vizsla with a huge personality. But I thought it was worth putting him on the blog again. Enjoy meeting Toby (again!). Toby is our 4-year-old Vizsla who I am convinced is more boy than dog. Toby arrived into our lives shortly after we lost our beloved Golden Retriever, Biggles. I am convinced that Biggles chose Toby for us. Biggles was my soul mate dog who stayed by my side through many dark times. Four months after he died and I was still doing the ugly cry. My hubby threw me in the car one day and took me to a rescue. Toby came home with us and has been one of the centers of my life ever since. Here's Toby. Those eyes are deep and full of wisdom. He is a very active and playful dog. He just loves the snow! We have a grown son who lives in New Hampshire and Toby’s favorite thing to do when we visit is to hike a mountain. When he gets to the top there is much celebrating. Toby loves, loves, loves to have an ice cream. God help anyone - man or dog who comes between him and his ice cream. He is famous for the silent snarl, but the show of teeth leaves no one in doubt about his intention, “You touch my ice cream, I'll get you!" My standard phrase on July 4th is: "We could have won you know, we only sent 10,000 soldiers." Apparently this does not go down very well, but the neighbors understand that the house and the dog will be all decked out with Union Jacks on Independence Day! Toby also has a special relationship with my youngest son, Elliot. When they are together they are really stuck like glue. Neither of them seem to mind this predicament. Toby is such a sensitive dog who has a special relationship with his dog owners. This can cause some serious separation anxiety and he can be a little, let’s say, defensive if he feels an approaching dog may not be friendly. He does not really give them a chance…does that good ole silent snarl for good luck. He is so sensitive I thought we would train together as a service dog and partner. All was going well until he did his famous silent snarl to all the participating dogs and we were asked (very kindly) to leave. Being expelled from class, not our proudest moment. So, this is my Toby, he is my shadow, my Velcro dog with all his faults and nuances. I cannot imagine life without him, he brings joy, love and many doggie messes, like sticks in the house, the odd dead squirrel (not kidding!) and an abundance of energy.